Ahhh Christmas, A Pagan celebration that the Christians hijacked as a vehicle to spread their message and hate. America didn't even celebrate Christmas until recently. But like most of the history of Christianity the typical American Jesus freak don't even know or care. The pilgrims, English separatists that came to America in 1620 were orthodox in their Puritan beliefs. As a result, Christmas was not a holiday in early America. From 1659 to 1681, the celebration of Christmas was actually outlawed in Boston. Anyone exhibiting the Christmas spirit was fined five shillings. After the 1776 American Revolution, English customs fell out of favor, including Christmas. In fact, Congress was in session on the first Christmas under America’s new constitution on December 25, 1789. In 1828, New York city formed the city’s first police force in response to a Christmas riot. Christmas wasn’t declared a federal holiday until June 26, 1870. Before the Civil War the North and South were divided on the issue of Christmas, as well as on the question of slavery. Many Northerners saw sin in the celebration of Christmas; to these people the celebration of Thanksgiving was more appropriate. But in the South, Christmas, Jesus and the Bible were an important part of the social season and the Bible was used to prove their right to own slaves. Not surprisingly, the first three states to make Christmas a legal holiday were in the South: Alabama in 1836, Louisiana and Arkansas in 1838. Eventually the Christmas holiday migrated throughout America in much the same fashion as Sweetest Day is slowly taking over now. Most of the country has never heard of Ohio"s Sweetest Day but in twenty years everyone will think it has always existed. Christians blindly believe that Christ was born on Christmas. This like most of the bible is a myth. The Jesus myth's birthday was never christmas until the Church created the celebration on top of the popular pagan holidays in an attempt to kill the competition. Ask a Christian about The Epiphany and watch the blank stare. Ask why Joseph and Mary were at Bethlehem to pay their taxes when taxes at the time were paid no where near Christmas time... The truth only enrages the blindly uninformed religious zealot. Discrimination in the name of Jesus is an old time tradition throughout history of the world. Except Jesus' love or be tortured and killed has worked well for the believers of Jesus. The millions and millions of people all over the world have been buried in nameless mass graves over the centuries to prove Jesus' love. It is just proof how far a true follower of Christ will go to force their beliefs on others. This ageless sentiment has not been lost in America. The religious right are alive and well and are still proud to hate in the name of their Lord Jesus Christ. Evangelicals feel they have the authority to speak as Jesus and feel so self-rightious that they are outspoken in their belief to speak as Jesus. Take the three ladies from ohio being promoted on the Fox network as official Jesus speakers. They insist that Jesus has said he misses the phrase Merry Christmas. 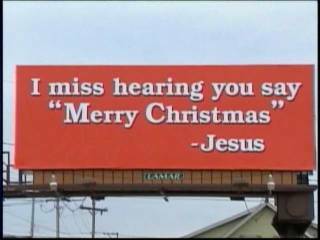 They are so sure that Jesus is speaking through them that they are renting billboards around the country saying so. Find the word Christmas in the Bible... I dare you. Most American Christians believe it's in there. Maybe their time would be better spent sharing the true teachings of the Lord on billboards. "Nothing in Christianity is original. The pre-Christian God Mithras - called the Son of God and the Light of the World and the model for the invention of the Jesus figure - was born on December 25, died, killed for everyone's sins by being nailed to a tree, was buried in a rock tomb, and then resurrected in three days. By the way, December 25 is also the birthday or Osiris, Adonis, and Dionysus. The newborn Krishna was presented with gold, frankincense, and myrrh on December 25th. Even Christianity's weekly holy day was stolen from the pagans." With the pulpit of FaceBook millions of "loving" Christians are now posting pictures of hateful signs etc. 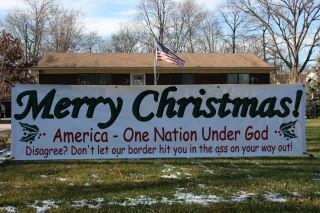 from around the country and celebrating in their belief that all non-believers should convert or be deported! If that doesn't scream hypocrisy nothing does. The Bible states clearly that public display is frowned on in Mathew 6:6 - But thou, when thou prayest, enter into thy closet, and when thou hast shut thy door, pray to thy Father which is in secret; and thy Father which seeth in secret shall reward thee openly. The Archbishop of Canterbury, Dr. Rowan Williams, dismisses the Christmas story of the Three Wise Men as nothing but "legend". It is but myth and pagan merry making that the Jesus freaks somehow have decided constitute a mandate from god to threaten and hate. Modern Christianity has become a comic book like religion. The followers live and breath in the pool of Jesus without reading the book themselves. They wave it around with great conviction only knowing the bumper sticker sayings they have been told is written inside since they were children. To actually believe that if you get hundreds of your contacts on a social network to type a set of magic words on your page that a magic spell will be cast and the sick relative will be magically healed. Yet when the magic invisible FaceBook pixie dust doesn't save aunt gertrude they will be right back undaunted asking for a new magic spell to cast online when uncle joe is dropping from cancer. Failed prayer after failed prayer doesn't dim the zealous of the true believer. This blind devotion is fine. It just needs to be contained within the bubble of delusion that it resides. The forty plus million non-jesus folk that are out here in America minding our own business are growing tired of having the "saved" angrily screaming at us that without Jesus there is no love... take it or leave it!! We are tired of the endless assaults on our sovereignty. The insistence that the religious have the RIGHT to teach children from non religious families to pray in school is outrageous. To feel the RIGHT to force through peer pressure and public PA systems Bible lessons and prayer at the start of every school sports event on your child is unacceptable. These same Jesus do gooders and spreaders of the love have become violent at the mere thought of a group of people being allowed to teach their children the truth of the worlds religious histories. These same people will riot over teaching fact in school science classes that contradict the fairytales of the Bible. Christmas is about families and love. It was fun long before Christians changed the name and anyone knew the cross was a religious symbol and best used to beat non-converts over the head. The Jesus camp needs to lighten up and have some fun before it's to late. Enjoy your Pagan tree all light up with your Pagan lights sitting in front of your Pagan Yule Log smugly looking down your nose at the Pagans and non-believers. The mainsteam Athiests don't care what you do at home or in your church. We are just sick and tired of people who think they have the right to shove their cross down anyone's throat they please in the name of Jesus... Or we can leave our home and country... 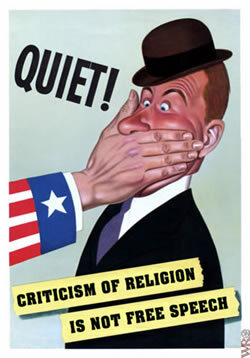 The Inquisition is alive and well in America.